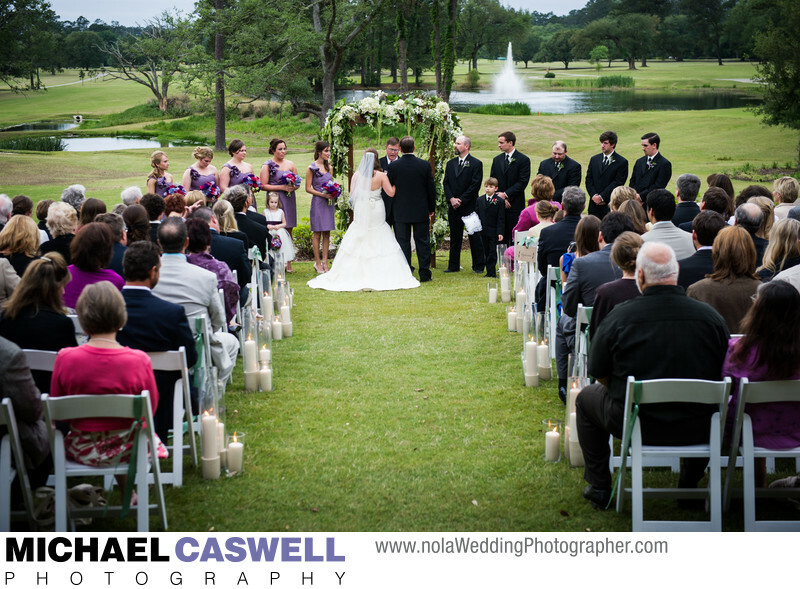 In this photograph, the bride and groom exchange vows during a ceremony overlooking the beautifully manicured grounds of the Tchefuncta Country Club in Covington, Louisiana. The lush greenery and water features of the golf course made for a gorgeous backdrop for their ceremony, which was officiated by the groom's father. This wedding took place on a perfect afternoon in April, which with its pleasant temperatures is a very popular month for outdoor weddings in the New Orleans area. This image is a great example of magic hour (the last thirty minutes or so before sunset) light, which is a joy to shoot in and provides a pleasant, soft light that lacks harsh shadows that direct sun earlier in the afternoon can render, and doesn't cause squinting. Their reception was held at this venue as well, in their indoor event space, with the well-known St. Tammany Parish band Witness providing the entertainment. Location: 2 Pinecrest Dr, Covington, LA 70433.